When a group of Coptic Christian families set out to visit the Monastery of Saint Samuel the Confessor in Minya they could have no idea they would not all be returning home. But on their return journey the buses carrying the pilgrims were attacked, leaving seven dead and 18 injured. The injured were transferred to Minya local hospitals and then to Cairo’s 6 October district hospital in Sheikh Zayed. Minister of Social Solidarity Ghada Wali later announced the government would provide LE100,000 for the families of those killed in the attack. Those who were injured will receive LE50,000. A woman, four men, a 15-year-old boy and a 12-year-old girl were killed when the bus was attacked. Six of the victims were members of the same family. “There were three buses carrying a large number of families on their way back from the monastery. Terrorists ambushed the three buses, two were able to escape but the last was forced to halt on the road,” Bishop Macarius of the Minya diocese told Al-Ahram Weekly. Shehata, who was speaking from her bed in the Minya local hospital where she was receiving treatment for shrapnel injuries and gunshot wounds to her legs, said the driver had attempted to return to the monastery but was intercepted by one of the assailants’ vehicles. The attack took place close to the site of an earlier attack, in May 2017, which left 28 Christian pilgrims dead. In the immediate aftermath the Coptic Orthodox Church banned visits to monasteries but the blanket ban was soon relaxed. Many monasteries depend on income from worshippers and tourists. Ibrahim Farah, 31, was a passenger on the first bus which managed to flee the attack. He says the attackers were heavily armed and appeared to be aiming first for the driver and the tyres of the bus. Farah said she tried to contact ambulances and the police but, 15km away from the monastery, the mobile network was weak. On Friday a local Islamic State affiliate claimed responsibility for the attack via the group’s news website Amaq. The accounts could not be immediately verified. 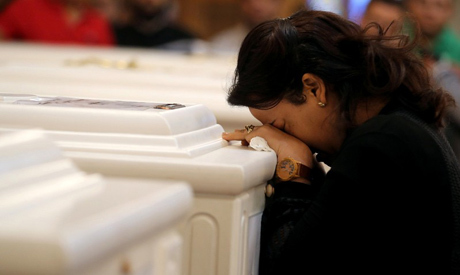 A day after the attack mourners attended the funeral for the victims at Minya’s Prince Tadros Church. During the funeral mourners held pictures of the victims and called on the authorities to act. Their grief turned to anger and the funeral prayers gave way to protest chants as the mourners carried a large wooden cross. “We want retribution for them or we will die like them,” they chanted. Copts in Minya see revenge killing as a right. It’s part of their culture and traditions, said Father Sargious. Anger was not restricted to the funeral prayers. Soon it was all over social media platforms, with the hashtag of Minya trending. Inflamed tweets amplified the calls for revenge. Two days after the attack the Ministry of Interior issued a statement saying it had killed 19 of the suspects in a shoot-out after police pursued “fugitive terrorist elements” into the desert west of Minya. Images of bodies and a tent in which the assailants were said to have been hiding were posted alongside the ministry’s statement. Guns, rifles and propaganda for the terrorist group could be seen next to the bodies. The statement came a day after President Abdel-Fattah Al-Sisi, who was attending the World Youth Forum in Sharm El-Sheikh, vowed during one of his talks “to avenge the martyrs of Egypt”. “I mourn with deep sorrow the martyrs killed today by treacherous hands which aim to undermine the fabric of the nation, and I wish the injured a speedy recovery,” Al-Sisi said. Bishop Macarius said that some in Minya are sceptical of the Interior Ministry’s account of the tracking down of the alleged assailants. People have been protesting, he said, and demanding that anyone responsible for security failings be held to account. In a brief video Pope Tawadros II sent a message of faith and hope and prayed for peace and unity. “In the hope of the resurrection, we bid farewell to them and know that God controls all events in all our lives,” he said. Following the May 2017 attack Bishop Basilios, head of the Monastery of Saint Samuel the Confessor, met with Minya security officials to discuss safety and security procedures around the monastery. The monastery made a number of requests, including paving the 30km-long access road to the monastery, improving the mobile network along the road and deploying CCTV surveillance cameras at the entrance to the monastery. Security officials promised to take the necessary actions and it was reported that LE30 million had been earmarked to pave the back road to the monastery. During the funeral Bishop Macarius attempted to calm the grieving mourners with words of faith. “No one accepts injustice, intimidation and bloodshed. I am grieving with you, they were our sons too,” Macarius said. The attack was met with widespread condemnation, local and international. Roman Catholic Pope Francis prayed for the victims of the terrorist attack, saying that they were killed “for the mere fact of being Christians”. Father Sargious says officials in Minya have promised to build a cemetery in the centre of Minya governorate in which the martyrs can be buried.